The majority of auto dealerships provide service to new and existing car owners that have auto glass damage. It is not convenient for many drivers with busy schedules to make an appointment and wait for a glass repair. PG Simi Valley auto glass repair specialists take the waiting and effort out of glass damage repair. This mobile response service comes directly to a stranded driver and completes a professional repair or replacement of car and truck windows. Local residents depend on reliable service immediately after damage occurs. Any obstruction to your windshield due to broken or cracked glass affects your safe driving ability. State laws protect innocent drivers from drivers that operate motor vehicles that are unsafe for transportation. PG Simi Valley auto glass repair technicians can replace or repair damage to your windshield to increase the safety factor of your automobile and help you comply with state laws. It can be a costly experience if window damage is not fixed promptly due to the inclusion of traffic citations. When selecting a mobile auto glass company, the response time for arrival is only one of the important considerations. The quality of the glass and warranty against defects and damage is an essential part of making a decision. PG Simi Valley auto glass replacement services include manufacturer rated OE glass and include a lifetime warranty for workmanship and installation. This guarantees no leaks or further damage due to improper installation and creates a show room condition for your automobile windows. Commuting to work or school is shown to increase the risk of accidents for many drivers. Business owners that depend on travel for income generation are at the highest risk for automobile damage. Deliveries and pickups are based on tight schedules and the rush to complete all tasks on time can increase collisions that cause glass damage. PG Simi Valley auto glass repair technicians respond quickly to calls reporting damage and work quickly to restore motor vehicle glass for business owners to decrease the disruption to company schedules and daily routines. No matter what the brand of your automobile is, our technicians for auto glass replacement in Simi Valley carry the right brand of auto glass for your vehicle and can replace it in the shortest amount of time possible. If the glass is repairable, our mobile vans for auto glass repair in Simi Valley carry the necessary equipment to get the job done as soon as possible. Are you looking for a reliable auto glass repair and replacement service in Simi Valley, CA in zip codes 93062, 93063, 93064, 93065, 93094 and 93099? 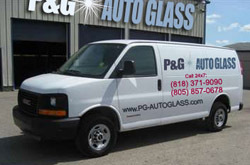 Contact PG Auto Glass for all your auto glass repair and replacement needs.